Meghan Reinhardt is passionate about nonprofits. But, she’s building her career in finance. They’re completely different fields — but, Reinhardt sees important crossover. Most importantly, she sees a route to reaching her ultimate goal: giving back. Reinhardt grew up in Fremont, Neb., a small town just west of Omaha. Her childhood home was on a lake, and she spent summers wakeboarding and waterskiing. She has two older half-siblings and the youngest is 14 years her senior, so she grew up mostly as an only child. But, she was happy to entertain herself, which she did by meticulously organizing the cupboards and drawers throughout her house and mastering Donkey Kong on her Super Nintendo. At school, she played volleyball and tennis and was always very active. Her mother was an optician, and her father worked in sales at Valmont Industries and later led the sales and marketing efforts at Komet Irrigation. She also knew she wanted to do some good in the world. So after she graduated, Reinhardt went to work with AmeriCorps, a volunteer service organization. It placed her with El Centro de las Americas, a nonprofit that provides education and family support to Hispanic people in Nebraska. There, she helped develop health and literacy programs, market local fundraisers, and organize events. She found fundraising to be a natural fit. “Sure, you’re promoting the cause, but people give to people, not causes,” she said. “It’s all about building relationships.” Reinhardt realized she had a knack for influencing others, and her interest in sales took root. While she loved her time at AmeriCorps, it was also one of the most difficult periods of her life. It was then that her father passed away after a battle with cancer. The loss marked a turning point in Reinhardt’s life. “My father taught me many things,” she said. “Unconditional love was the first.” At the time, she had been thinking of traveling to Central America, and her father’s passing encouraged her to take the leap. It also solidified her goals of giving back and making a positive impact in the world. So, Reinhardt packed up and headed south to Costa Rica. Her uncle had a place in Grecia, a city on the eastern edge of the Central Valley, so she stayed with him and his family for three months while she volunteered at a medical clinic in nearby Alejuela. It was her first time abroad and the first time she encountered real poverty. “People were living in deteriorating huts with dirt floors,” she recalled. “They were cooking their food by gathering trash in the gutters and burning it.” It was an eye-opening experience, and Reinhardt knew this was just the beginning of understanding the world. She wanted to keep traveling and exploring. 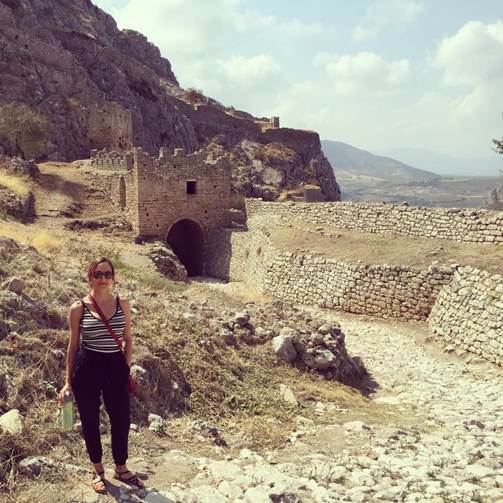 Meghan Reinhardt in Ancient Corinth, Greece during her mission trip in 2016. While finance might seem distant from the nonprofit world, Reinhardt says learning how to manage money effectively is a critical skill. “Working with limited resources challenges you to think outside the box,” she said, “and makes prioritizing and budgeting imperative.” It’s a lesson she hopes to pass on if she ends up back in the nonprofit sector. That is a goal she’s keeping in mind but not for the near term. For now, she wants to accumulate as much knowledge and experience as she can to accomplish her ultimate ambition: to contribute to people’s lives in a positive, meaningful way — one way or another.